The presence of a wealth of rovers limited Stackpole’s chances at Collingwood and he found himself on the bench more often than not. He was recruited from Abbotsford and was 19th man in the 1935 and 1936 flag sides. Nuggety and talented, he eventually had to leave Victoria Park, but ironically he would have been first rover if he stayed at Collingwood because of a number of departures. 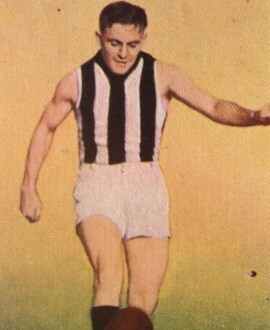 He blossomed at Fitzroy and played a full game in its 1944 flag side, establishing himself as a team leader. Stackpole played cricket for Victoria as did his son Keith Junior, who went on to become a fine Test batsman.